There are few meals as mouthwatering as prosciutto pizza recipes. 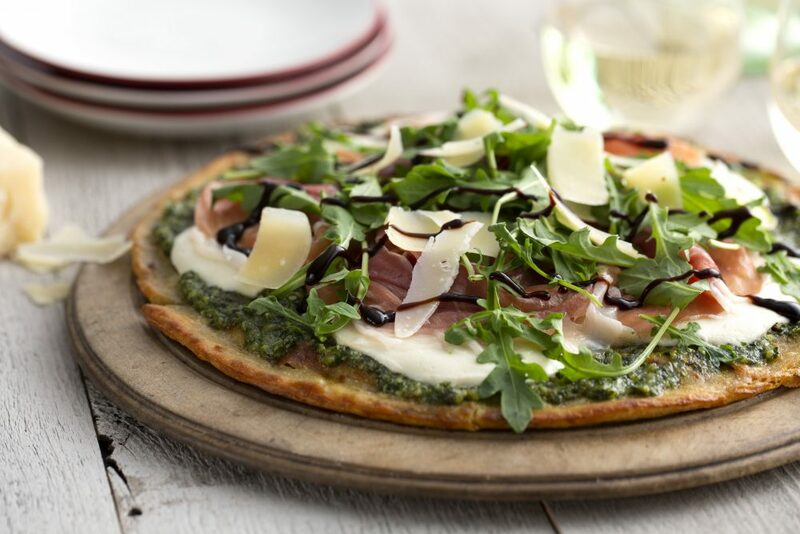 Our pesto & arugula cauliflower prosciutto pizza is no exception. This low-carb dish, topped with basil, walnuts, shaved cheese and of course, prosciutto, is sure to be a crowd-pleaser at your next family, friend or even book club get-together. Prepare cauliflower crust according to package directions. PESTO: Meanwhile, in food processor or blender, puree olive oil, basil leaves, walnuts, grated Parmesan and garlic until smooth. PIZZA: Preheat oven to 450F. Spread pesto on baked pizza crust to within ½-inch of edges and top with fresh mozzarella. Bake 5-7 minutes or until pizza is hot and cheese is melted. Top with prosciutto and arugula and drizzle with balsamic glaze. TIP: In a hurry? Substitute a heaping ½ cup of store bought pesto for the homemade pesto!